Watch out for Team Bamboo's Karlo Mojica vs. Sean Oquendo in final battle of The Voice of the Philippines Season 2 on Sunday, December 21, 2014 at 8:30 PM. Karlo Mojica does not let his disability stop him from getting to where he wants to be. He loves to travel ever since he learned to use crutches. Through joining The Voice, he wanted to inspire those with disabilities to reach their dreams. 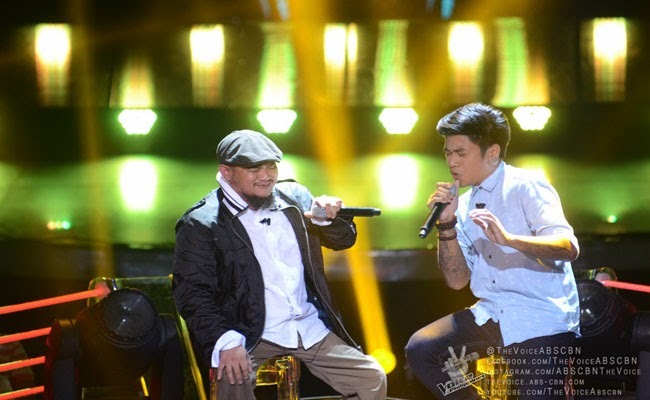 He had sang ‘Bulag, Pipi, Bingi’ and secured a spot into the Battle Rounds when Apl and Bamboo turned their chairs. Tattoo artist, Sean Oquendo says that he does not belong in rock genre. Despite this, he sang ‘Ako Na Lang’ and that also made him seemed like a rock star to be. Bamboo took his time before he had eventually turned his chair. Lea said that he seemed nervous Bamboo expressed his excitement to work with him. Bookmark and reload this page to find out who will get to the knock out rounds on December 21, 2014.